Key Difference: Both Evernote and Google Keep are note taking service applications, but the key difference between Evernote and Google Keep is that Evernote is cross platform, which includes supports for iOS, Android, Windows, macOS, and Web, while Google Keep supports Android, iOS and web. 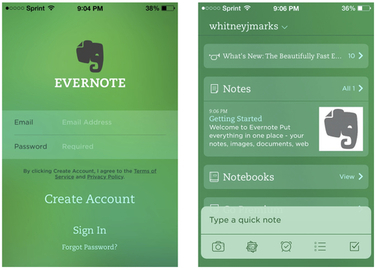 Evernote is US based note-taking service is developed by the Evernote Corporation and was launched in open beta in 2008 on June 24. Evernote, headquarterd in Redwood City, California is cross-platform and supports iOS, Android, macOS, Microsoft Windows. It is free to use with monthly usage limits and paid plans for expanded limits. A feature rich and document organising tool with exllent feature with large documents, notes. All types of files can be shared with access from multiple devices and sharing it with team members. Portable versions is also availble for flash drives and U3 drives. It is a free service but also provides with upgrading feature to Plus, Premium or a Business account. Merge notes: Merge feature allows you to merge similiar notes and consolidating items in one file. This feature can be seemn in the notebook section and merge notes. You can also merge PDF files and also merge audio note with an image so that there is one file and organised. Customisation: Users can customise the Toolbar and Sidebar. Located in the app's menu bar, under view, are the menu options Customise Toolbar and Sidebar options. Password-protect text: Users can password protect a text, image, any file within the note. For this feature, select the text that you wish to have password and right-click and select the Encrypt Selected Text option. you can also choose whether you want the app to remember the password or not, until you quit the application. Mails: Can save mails with bys imply forwarding the mails to Evernote e-mail address. Undo and Redo: allows undo and redo while editing and all changes are finalised before saving. Choose themes: It allows you to choose from light or dark green theme. Chatting: In business account, users can chat with team mates. Browse History: Users can also restore the older version of their which was deleted by mistake or can go on the computer to the evolution of the note. Skitch and Web Clipper Integration: iOS or Skitch users can quickly annotate notes using Skitch and can clip from web to desktop or mobile through simplified formatting which quick and flexible with highlighting, tagging notes and taking notes. 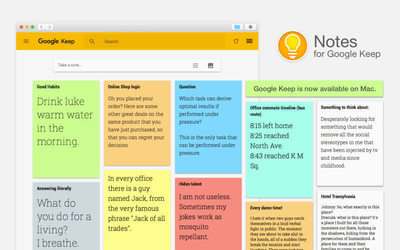 Google Keep was launched by Google in 2013 on March 20 and is available on Web and has mobile apps for Android and iOS. The note taking service offers various tools to take notes like audio, texts, images and list. Google Keep provides option to set reminders which is integrated with Google Now. The app is availbale on platforms on Chrome and Desktop as well other than Web, Android and iOS. The app can also transcribe your recordings in text format and can create notes lists and notes through your voice. The users can also separate image and text from the image using optical character recognition. The interface allows with single and multi-view column option. Users can create their notes in a checklist format and the notes can be coloured for segregating the notes with options for orange, yellow, white , red, green, teal, blue or grey. The text can be automatically copied in Google Docs document by choosing the "Copy to Google Doc" button. Users can also categorise their notes using labels through the app's notification bar and can choose from list of labels. All in one App: Users can keep everything in one place. App can be used for pinning down your brain -stormed ideas, grocery list, audio, photo notes, to-do list. It also offers a check list with setting reminders for your list. Easy Search: Search your lists from seach bar and will filter your search with keywords, colour and even the note type like image, reminder, audio, link, list etc. It also identifies types of notes a users has like the user has book titles or music, or grocery list, the app will filter the search to groceries or food, books etc. Quick and Easy: Users can save web pages through Google Keep Chrome Extension, which is similiar like Evernote Web Clipper. It also has widget option to have access on a swipe. Creative: Users can also satisy their creativity, other than ca checklist or daily simple to-do lists, users can create a visual bucket list like a digital sketchbook and can be transformed into flashcards or use it shopping plan. Visually oriented: Images or visuals coupled with colour with colour coding and using bullet form for analog system or journal keeping, that can help a user keep a direct connection to their digital and physical notebook. Sharing notes: Collaborate your notes or list with someone else easily through it's integration that allows the uer to share the notes and the other with access to edit texts, images, drwings, recordings and anything else. Export your notes: Keep allows you to export your notes to Google Docs due its integration and enables the user with more robust features to edit or to have extensive texts format. Users can also create a direct link with Google Docs and Google Keep notes by going on Google Docs tool and Keep Notepad in the tool feature and the notes will appear in sidebar next to documents. Calendar: Keep a link with calendar as well with Google Calendar and keep a reminder or add a reminder to the keep notes. Google Drive Integration: Heavy google users can have information integrated with Google Drive. Audio Notes: Both the apps offer the same feature of audio notes or voice-to-text-dictated notes, memos, images and checklists. Sync Data: Both offer seamlessly sync this data with web and other clients in Evernote. Types of Notes: Both offer types of notes which are different like in evernote, users can create a text, audio, a photo or an attachment as a note, as well as checklists and photos while in Google Keep checklists are different than the notes which can be marked with each different line as an different item that can be checked or ticked. Widget in Home Screen: The Android version of both the apps offer widgets, which can be configured on the home screen. Notes based on photo: Both the app offers users to create notes based on a photo and also to add text to that note for more context. Different features functions on different platforms. Colour coding and tags or labels. Free for usage of 60MB/Month, $ 5 per month for 1GB Premium and $ for Business. New update lets Google convert image into text.